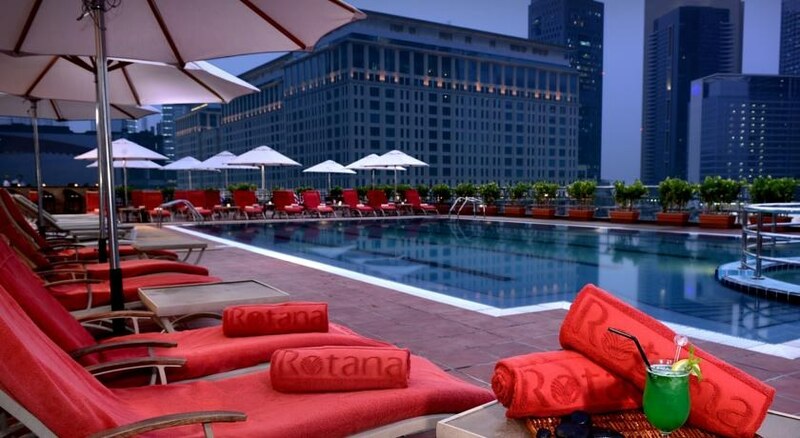 The Rose Rayhaan by Rotana is the world’s tallest hotel soaring 333metres and 72-storeys. Recently built, the hotel sets a new standard in comfort and style from a great location on Sheikh Zayed Road with panoramic views of Dubai. 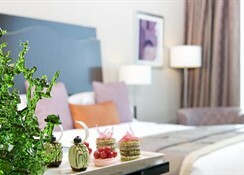 The Rose Rayhaan Hotel is next to Trade Centre as well as the DIFC and its metro station, and is ideally situated only few minutes away from the world's tallest building- Burj Khalifa, and the major shopping malls such as the Dubai mall and the Emirates mall. 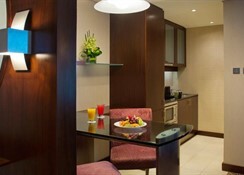 All 482 spacious rooms and suites offer high-speed broadband internet connections, complimentary tea and coffee making facilities, air conditioning, flat screen satellite television, a safe, bathrobes and a hairdryer. 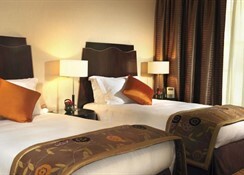 The hotel also offers three food and beverage outlets, a fully equipped gymnasium, wireless internet connection in the public areas, a business centre with professional secretarial support, laundry and dry cleaning facilities, currency exchange, babysitting services upon request and a shuttle bus service to the major shopping malls. 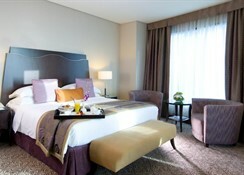 The Rose Rayhaan by Rotana also enables its guests to keep fit and relax in the state-of-the-art Bodylines health and fitness centre which offers fully equipped gymnasium, an outdoor swimming pool, cardiovascular and weight training equipment, fitness classes, massage rooms, a sauna, a Jacuzzi and a steam room. Offsite activities including sight seeing trips, desert trips, fishing trips and golf can be arranged by the hotel staff. The air-conditioned establishment offers a lobby with 24-hour reception and check-out service, hotel safe, currency exchange facilities, lift access and a hairdressing salon. Guests may dine in the restaurant, and WLAN Internet access, room and laundry services, a car park and garage are further facilities. Petals is an informal yet stylish all day dining restaurant located on the first floor serving buffet style breakfasts and lunches as well as a la carte dinners. Café Rose in the lobby serves refreshments, light snacks, afternoon tea and homemade pastries and the Aquarius pool cafe is the perfect choice for casual dining poolside with light snacks and refreshments which includes mocktails and healthy juices. The hotel does not serve alcohol. Dubai, the fast paced, fast growing city well known for its lavish hotels and resorts, it’s now hard to believe that Dubai was nothing more than a dessert landscape just short of 25 years ago. Dubai is now a modern metropolis of impressive buildings, tourist attractions, and stunning manmade islands. Deira is located on the east side of the Dubai Creek. Deira is Dubai’s oldest and busiest neighbourhood and is filled with traditional sights, sounds and smells of the city. This neighbourhood is home to some of the city’s top tourist sights, like the Gold Souk, Textile Souk, Spice Souk, and Fish Souk. We would like to inform you that the Swimming Pool at Rose Rayhaan by Rotana will be closed from 15th May 2018 until 15th June 2018 for renovation. During the above mentioned period, they have arranged an alternative facilities for guests to have an access at Towers Rotana Hotel swimming pool. During the renovation period, the Gym and other facilities at Rose Rayhaan by Rotana will remain open and operate as per the normal schedule. We would like to inform you that the renovation of the Swimming Pool at Rose Rayhaan by will be extended until 30th June 2018 and will be back to normal operations on 1st of July 2018. Previously communicated alternatives and other facilities operations will remain the same.